I've always loved watching the cooking shows of Nigella Lawson because she is trés stylish, makes scrumptious and beautiful food, and I loved hearing her British accent. I haven't seen her cooking shows in a long time and apparently she's on Food TV with her new show, Nigella Feasts. 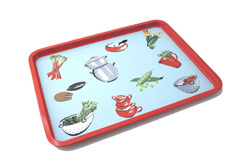 I found out she just launched her online store Bliss which carries her beautiful collection of kitchen and serving ware. (Thanks Felicia!) 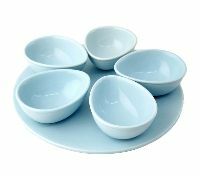 There are 3 different collections, the Classic Collection which features pale blue and cream, the Graphic Collection which features fun vintage styled prints, and finally the Licorice Collection in sleek black. Special Internet offer to raise money for the Lavender Trust at Breast Cancer Care. I really love paper. What I haven't had the room for lately, much less the time to indulge in, was gift wrap. My former roomate Kathryn was really good at this. 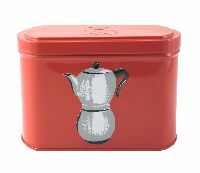 We used to have a cabinet in our old victorian style apartment that was simply for gift wrap, boxes, etc. It was our "Martha" cabinet. Living though now in a loft space, its hard to find good storage solutions so I've pretty much abandoned all hope to collect this stuff again. Right now, I have a measly little kate spade bag stuffed with ribbons and tissue paper on a shelf in the closet. Today I came across Shop Heidi. 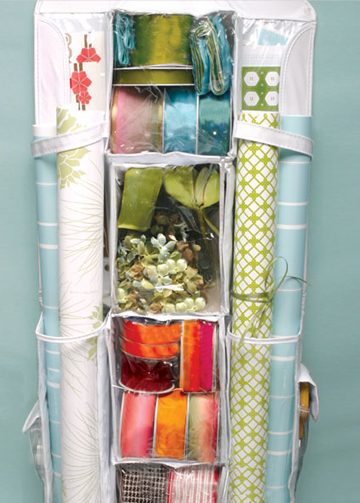 Not only are there some really pretty wrapping paper for sale (along w/ note sets and journals), she even sells this great hanging storage solution which is perfect for me and the price is perfect at $19.99. I'm totally getting this! But Heidi doesn't stop there. 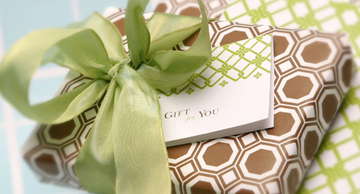 She gives you lots of tips on how to wrap, how to recycle scrap paper, and more. 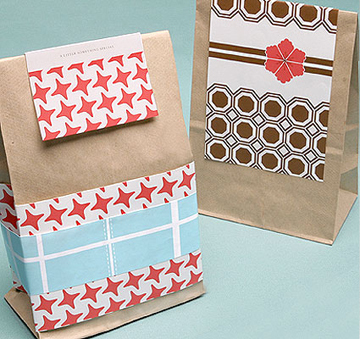 I like this solution of using scrap paper as a band design around plain brown paper bags. It looks so stylish. I love it! These Maloo Laptop cases (via Cool Hunting) are not only sleek and modern looking, they fold up and out like a Japanese Kimono. The art of it is fun, but it also becomes useful because you can lay your laptop case flat and as it folds out. The sides become a nice area to use your mouse pad. Sometimes I never know where to throw my laptop bag when I'm out and about, and often times in cafes I'm not so sure I want to set my laptop directly on the tables. 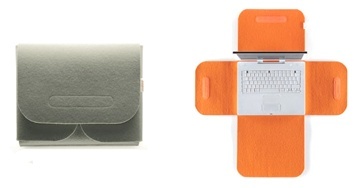 Made in wool felt, the laptop sleeve comes in vibrant orange or grey. Of course the really cute one is made out of vintage kimono fabric. Unfortunately, those are only available in Japan. I found the perfect teeny-tiny laptop bag for my new Apple 12" laptop I got a few weeks ago. I decided I wanted something much more compact and on-the-go. I didn't want a lot of bulky pockets and I wanted something I could hold rather than put on my shoulder. I found everything I needed in a little pink package as I was browsing the goods at the store Flight 001. The photo here doesn't really do it justice. The bag is much more cute in person when you see the size and shape. The pink canvas material with chocolate brown trim (my Coquette colors!) makes me happy each time I use it. 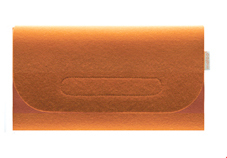 The padding inside is great because it really protects the laptop. 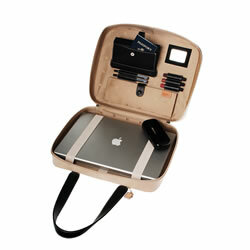 Its really compact so you can also use it as a laptop sleeve and put the whole thing in a larger bag. I'm all about options and these days I like the idea of not weighing my shoulders down. I can use my day-to-day handbag to be stylish and still carry around my laptop if I need to. The extra brown shoulder strap is included if I do change my mind. Even as this is a small bag I can still fit the charger and a notebook in the smaller front zipper. At a price of $54, its totally worth it! 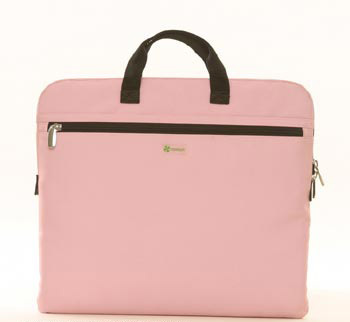 I am constantly in search of cute laptop bags (and other gadget holding accessories) for the ladies. Why is everything out there so "heavy" and just seems way too techie... too MALE??? I'm surprised there aren't more brands out there creating cool hip things for us working women. Thankfully, I came across the Tote Le Monde web site, a company famous for its french-style plastic tote bags. 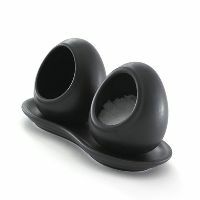 I had no idea their product range was so much larger now and I found so many fresh new modern things. What caught my eye was the Geneva Computer Bag. A messenger style bag that had the cutest colors that just felt fresh to me as I imagined myself jetsetting across town to that important meeting. Nice leather straps and an adjustable laptop protector, all with an affordable price range was just my cup of tea. What I loved was this line in the description "When your ready to trade in your laptop bag for a baby bag, just switch the laptop protector for a diaper changing pad and your bag is all set to go. " Not that my clock is ticking or anything, but the thought that I'd have this laptop bag for long enough until I have a baby AND that I'd have the option to use it for a baby bag was kinda ingenious! I'm all about mulitpurpose. 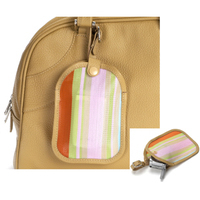 For sure I am going to get the aptly named Hollywood Cell Phone Pouch. At 14 bucks it's a steal and you can clip it onto the zipper of your purse so that you aren't digging in your bag for your phone. I also like the Phoenix Cases, a set of 3 nested bags that have a clear strip in the front so you can see the contents inside. I use cosmetic bags like these when I travel to hold my cellphone, digital camera, and all the respective chargers and accessories so I have everything in one place. 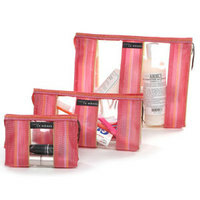 Its amazing what these little bags can do besides hold makeup. For a more luxe budget there's a new line of bags out from Marka. I caught a small article on the 2 women featured in this October's Lucky magazine. All the bags are really, really stylish for the sophisticated city girl. The color combinations are so beautiful and sleek. If I could get anything, I'd go for the Denyn Sleeve from the Fall/Winter 2005 Collection. 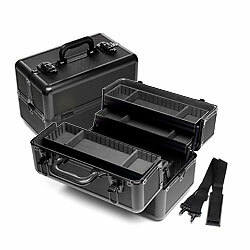 It seems to be sturdy and you can put a lot of items in the case along with your laptop. So there you have it. 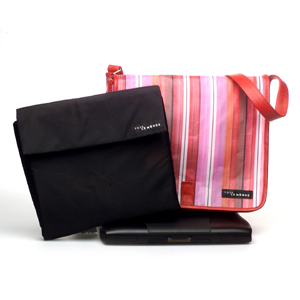 Lots of different options to carry around your tech gear without losing your girly-ness. 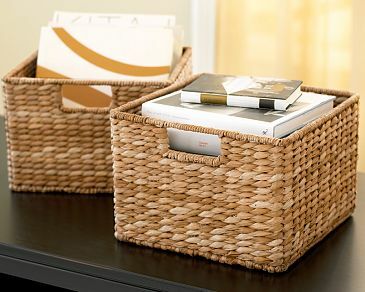 These days, I’m a stickler for organizing things because I realized that I have probably spent half my life misplacing things and looking for them. Okay, not really half, but you know what I mean. What I’ve found lately is that there are a lot more creative solutions out there, and they are not what is necessary touted in the latest magazines. Take my sewing box for instance. I am not into the gingham, Victorian, or country home wicker style look. I live in a loft in the city, not on the coast of Maine. And for the most part, sewing boxes that are sold in craft stores or online are just screaming, “Hi, I’m a grandma!” I needed something that had a lot of compartments and space, but looked slick. Here’s where Sephora comes in. I remembered the big displays of those makeup train cases. 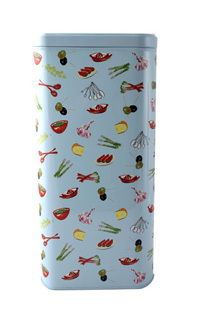 Something I had always wanted but I never had near enough makeup to fill up a case. 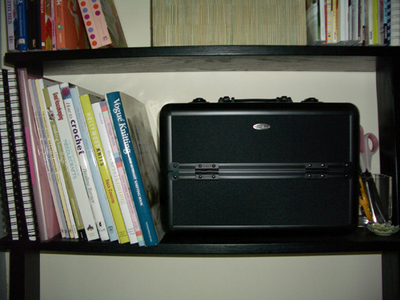 I decided to get one of the Midnight Train Cases ($90) to see if it would work as a sewing case. (Get a silver one if you’re feeling especially James Bond.) I liked how the compartments on this one opened up over the other ones. Voila! It was PERFECT! 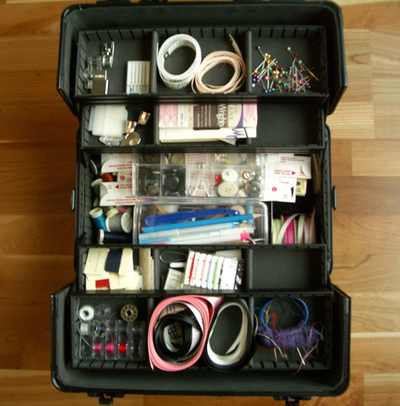 Now when I need anything related to sewing, I know I can just open up this case and find whatever notion, ribbon, zipper, or button I need. The same goes for trying to organize the technology in my life. I needed something to put my mobile phones (and their related cables, software), and also a box for all the software I have. 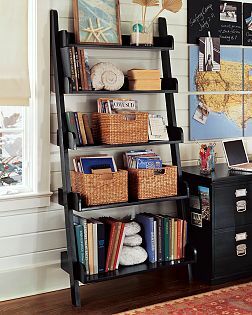 I had spend years putting things in various drawers or shelves and basically never could find what I needed when I needed it. Enter The Container Store’s clear plastic shoeboxes. Sure I use these cool clear boxes for my nice shoes like my silver heels from Siegerson Morrison, but I realized they can be used for so much more. First off, they are cheap, about $1.49 for 1 clear box with a snap lid. I like that they are clear so I can see what’s inside right away. 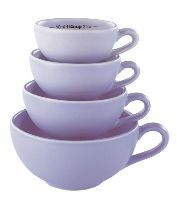 They also stack really nicely. 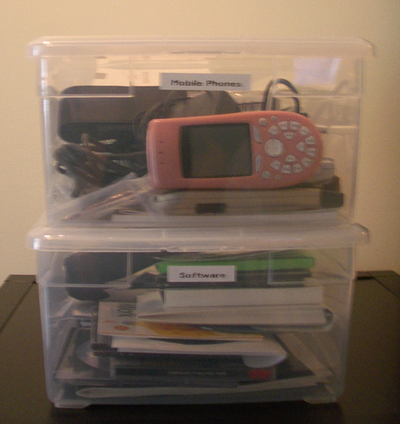 So in addition to my shoes, I have 2 boxes for the important techie things in my life, mobile phones and software. Things that I don’t necessarily use everyday but at a moments thought, may need to. I also made a couple of labels with my label maker. 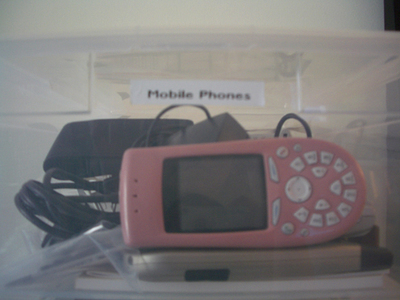 Now I know that if I need any of the contents related to mobile phones or software, I walk into the closet and grab the corresponding box.